Wedding favors made with two velvet sachets, olive green and ivory or brown and ivory colors, tied with wax cord and decorative olive leaf pin. Very useful idea since after the wedding you can fill the sachets with potpourri, place them in your drawers to keep your clothing smelling fresh. They are also available in white and fuchsia colors. The sachets contain tulle with 7 sugar coated almonds of the company Chatzigiannakis. 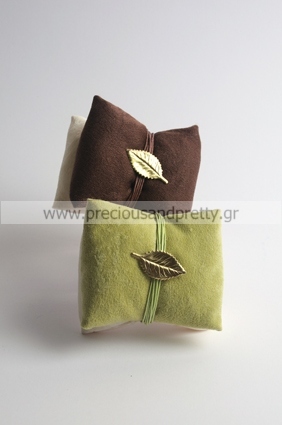 https://www.preciousandpretty.com/2012/01/weddingfavors-olive-leaf.html Greek Wedding Favors|Orthodox Crowns|Stefana|Baptism Invitations Wedding favors velvet sachets with olive leaf pin G7 Wedding favors velvet sachets with olive leaf pin G7 by Greek Wedding Favors|Orthodox Crowns|Stefana|Baptism Invitations Product #: Greek Wedding Favors|Orthodox Crowns|Stefana|Baptism Invitations_8416064872412038361 5 stars out of 5 reviews.